The last month of winter at LVM Nature Park in Tērvete has arrived with environment stories: “In the footsteps of blizzard” and “Resin, candle and others”. In February school groups together with the environment education experts of the park are following the footsteps of a blizzard – observing animal tracks and winter habits of four-legged forest inhabitants. 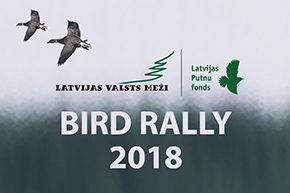 With interest, children are listening to the stories about the Latvia's Bird of the Year 2019 – hazel grouse, and animal of the year and the largest forest animal – moose. However, on weekends a creative participation in the splinter workshop of Inga Kļava entwines with paraffin light object making in collaboration with company “Sveču darbnīca”. If hundred and even more years ago candle making was a necessity and a household work, then in February at the Dwarfs’ Cottage everyone will have a chance to create a candle – an artwork to their own taste and wish. Before ancestors learned the skills of candle making, they used splinters. An elongated splinter chopped off from a dry wood put in a splinter-holder can be called the great-grandmother of modern lamps. Come and get to know forest in winter and learn about the ancestors of modern light sources – splinters, splinter-holders and paraffin candles! Information and registration of school groups for environmental stories “In the footsteps of blizzard” and “Resin, candle and others” by calling +371 28309394.